Many of the documents on this site are supported by DNA found on www.hilldna.com. And, the DNA referenced on this site can also be found on that site. You are encouraged to compare research with DNA and make sure that they support one another. Over the past 42 years, I have been researching the Hill families, especially those in Randolph and Davidson Counties, NC who descend from Sion Hill and Orpha Starage Lee. Along with the many other books published below, I have decided that it's time to write up the family history in Randolph and Davidson. This is a major undertaking because Sion Hill had eight sons who had large families. With the exception of the Hill families in these two counties who were Quakers, nearly every other Hill descendant comes from this line...unless Y-DNA proves me wrong. Keep your eyes open for updates on this project and hopefully it will come to fruition in 2018. Click here and be directed to the DNA Analysis of this Hill grouping. 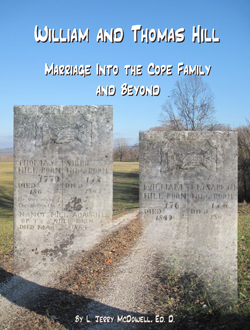 Coming in the first quarter of 2018 is my eBook on Green Hill who married Nancy Sneed in 1819 in Wake County, NC and also I will include Joseph Hill who married Elizabeth Johnson in 1825 in Johnston County. They both went to Johnson County, Iowa in the 1838-1850 time frame. My research has led me to believe that this Green Hill was my fourth Great Uncle and a son of Sion Hill and Starage Lee. Y-DNA test results for descendants of Green and Joseph Hill have just been received are will be posted on www.hilldna.com within the next several days [posted today 12/14/17]. The DNA proves definitively that Green Hill is NOT a son of Sion Hill and Starage Lee. I'm somewhat dumbfounded at the moment, but I'm looking at who may be his father and it explains why he and Joseph Hill were related. The Y-DNA shows a 5 genetic distance between the descendants who participated in the Y-DNA test recently. Green and Joseph Hill were related. It is the purpose of this research to trace the William Hill and Elizabeth Cope and Thomas Hill and Sybia Cope from Wake County,NC to Overton County, TN and others as the family expanded. In addition, this researcher has identified living male heirs and tested their DNA. The results, which just became available 19 January 2017, prove that William Hill who married Elizabeth Cope is NOT a son of Sion and Sarah Hill noted in other research below. This has long been reported incorrectly on various Internet sites. Contact with the few descendants of Thomas Hill is still underway with hopes of making a connection and getting a DNA participant on his line. If William’s and Thomas’ DNA “match”, it doesn’t prove they are brothers, though they probably are in my opinion. They could be first cousins; but if they match, they do have a common ancestor yet to be determined. This is another "BUST" to the Hill lineages that need to be corrected. And so, who is the William Hill son of Sion Hill and Sarah Brown ... coming! 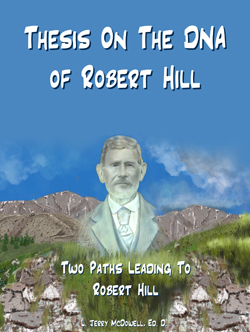 Two Paths Leading to Robert Hill? It is the thesis of this document that there is solid proof that Robert Hill (with wife Mary) are NOT the ancestors of the persons listed in Group 8 on the www.hilldna.com site. If they are, then there is a major DNA issue that needs to be addressed and those persons in Group 8 need to prove one critical piece of information to be discussed later. All of this is presented in the hopes that our Hill data and conclusions “morph” as they need to over the years as more information and research becomes available. It is not the intent to criticize anyone’s research. After doing genealogy research for over 41 years myself, that would be a painful and inappropriate approach. I encourage you to read this document carefully and share your opinions and conclusions with me and others in Groups 5 and 8 on www.hilldna.com. Not counting original documents, this 50 plus page Thesis is resourced with 52 footnotes and 18 images which include maps, deeds, inventories, wills, and original documents proving the research. Let's Get This One Right! 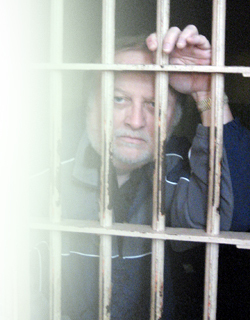 In over 40 years of research, this Sion Hill, son of Robert and Tabitha Hill, has been so wrongly miss-identified. Nearly every reseacher who has published this supposedly lineage claims that the son of Robert and Tabitha Hill died in Wake County with his Last Will and Testament in 1780. See immediately below for more information on the Sion Hill/1780. The real Sion Hill, son of Robert and Tabitha Hill died in Orange County in 1768. Many of his brothers and sisters and spouses all moved to this area of the State of NC in the mid to late 1760s. Orange County was divided and the land they owned is in current day Lee County. During the late 1770-1800 time frame, it was part of Chatham County. Sion Hill had one surviving son Abner Hill born in 1766 who moved back to Greensville and Brunswick Counties in Virginia where his mother's relatives lived. The documentation is very clear and this son Abner lived with his wife into the 1850s in Brunswick before he moved to Alabama and died there in 1855. All this and more is proved in this latest eBook to try and correct the lineages who have latched on to the wrong Sion Hill. You'll be surpised at the amount of documentation that is available. This book is highly resourced with 179 footnotes and 139 images which include family pictures, plats, inventories, wills, and original documents proving the research. Son of Sion Hill, Jr. I continue to research the Green Hill families in and around Wake County, NC since it is my belief that my g-g-g-g-grandfather Sion Hill was a son of a Green Hill who signed his wedding bond. I've not been able to prove it. However, the DNA for my extended Hill family places them in Group 5 on the HILLDNA.COM website. Those DNA markers seem to make him part of the family of the old Sion Hill [Sr.] who married Sarah Brown and died with a Last Will and Testament in Wake County, NC in 1780. The old Sion Hill [Sr.] had a son Sion Hill, Jr. who was deceased at the writing of his Will. 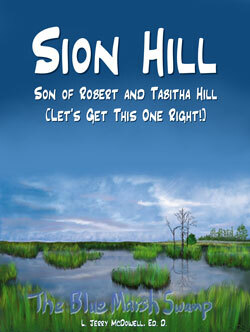 The Will names a grandson of Sion Hill, [Sr.] as Green Hill, son of Sion Hill, Jr., deceased. It is the young Green Hill who married Matilda Turner and is the subject of this book. If my research proves correct, this young Green Hill would be a first cousin to my Sion Hill who was born about 1773 in NC. There are about a dozen living male Hill descendants of this young Green Hill and DNA evidence will further confirm the Group 5 designation and pretty much close the door on where my Sion Hill family descends from. 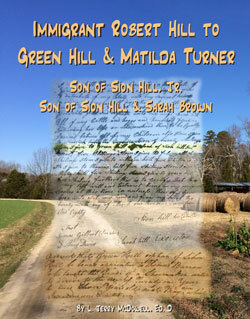 Green Hill married Matilda Turner and was closely associated with the children of Major Simon Turner from Johnston and Wake Counties in NC. He moved to Maury County, TN in 1816 and then moved to Madison County, TN in the early 1820s. His descendants are scattered in and around Maury County, TN, Carroll County, MS and beyond. This book is highly resourced with 258 footnotes and 93 images which include family pictures, plats, inventories, wills, and original documents proving the research. This is the story of the life of Simon Turner who was raised in Bertie County, NC and moved to Johnston County, NC around 1759-1760. 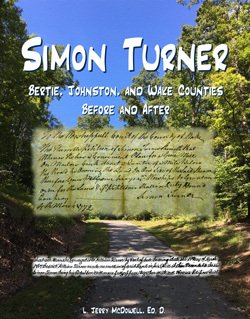 When Wake County was formed, most of his land was in Wake County on the Waters of Swift Creek, right on the Johnston County line.This research is focused on his children - John Turner, Winifred Turner, Simon Turner (Jr.), Matilda Turner, Edith Turner, Elizabeth Turner, and Mary/Polly Turner and their descendants. The original focus was going to be on Green Hill, son of Sion Hill, Jr. of Wake County, who was born May 1770 and married Matilda Turner. However, as the research continued, a great wealth of information was found on every line of the Simon Turner family and the book has really turned into a large volume on those families who moved into many of the southeastern states. This book is highly resourced with 910 footnotes and 301 images which include family pictures, plats, inventories, wills, and original documents proving the research. In print form, it's about 751 pages of research. researcher opened doors that led to the study of Drury King, his ancestors and descendants, several of whom married into the Green Hill family. This research was started in the Spring of 2014 and went down many trails before proving the King ancestors from Halifax County who moved to Wake County, NC in the 1780s. Many King descendants still live in the surrounding areas. Drury King who married Delilah Shaw in 1810 in Wake County had nine children. 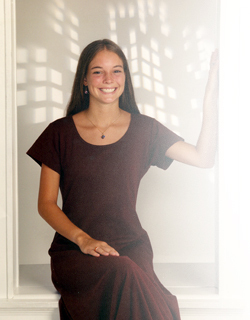 Drury never referred to any of them as a son or daughter in any legal documents found to date. This research studies what is believed to be the nine children and their descendants and the connections to the Green Hill family. This book is highly resourced with footnotes and 206 images which include family pictures, plats, inventories, wills, and original documents proving the research. 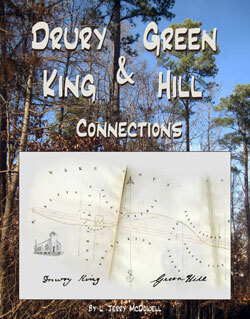 Drury King and Green Hill Family Connections. By Dr. L. Jerry McDowell. Published by the author; 2015. Available as an e-book at www.amazon.com for $9.95. 565 pages. Introduction; endnotes. In his newest e-book, the author documents the ancestry and descendants of Drury King of Wake County (ca. 1789-1875). King and his wife, Delilah Shaw, had nine children, all but one of whom remained in Wake County. Joseph J. King (1817-1874), one of their four sons, married Mary Hill, whose father was the subject of a similar e-book published by the author in 2012: Green Hill of Surry, Stokes, Rockingham, Wake and Randolph Counties. As in his previous e-book, the author uses a wife variety of sources to document the lives of Drury and Delilah King and their descendants. Included are over two hundred photographs and digital images of marriage records, obituaries, Bible records, land plats, newspaper clippings, etc. The author also incorporates a wide variety of transcriptions and abstracts of deeds, wills, estate files, and personal letters. Numbers embedded throughout the book link the reader to 672 endnotes containing source citations. Descendants will appreciate the author's attention to detail and his well-written narrative. There are many Internet sites and books with information on the life of Robert and Tabitha Hill; most of the research is filled with errors and is poorly documented. 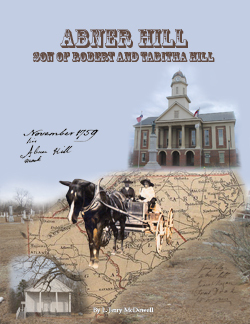 This current book focuses on the life of Abner Hill, son of Robert and Tabitha Hill, and his many descendants. Abner Hill was probably born in Surry County, Virginia where his parents were living at the time of his birth in about 1723. Abner is found on land records in early Edgecombe County, NC and even in records of Nash County formed from Edgecombe. By the mid to late 1760s, Abner moved to Orange County in that part that later became Chatham County and is now Lee County. Near the end of his life, he sold all of his land in 1786 and moved to Wilkes County, GA. He only lived until 1788 when he filed a will and his estate was administered. There are surviving estate papers, but the will book that contained his will was burned in an accidental fire. Abner's descendants are many. They are scattered over North Carolina, Georgia, Alabama, Mississippi, Texas, Tennesse, Illinois and certainly various other places currently not researched. This book contains a full investigation of all original documents supporting Abner's life and those of his descendants. There are 237 embedded digital images linked in this eBook along with census records, marriage licenses, tax lists, newspaper articles, maps, original deeds, land plats, etc., and 376 endnotes documenting the research. This research supports the DNA analysis for Group 8 on the www.hillnda.com site. To the knowledge of this researcher, over 90 percent of this data has never been published before. PS - Abner Hill, Jr. from Greene County, Illinois was definitely a clergyman - click here to open the PDF file! Laid to Rest at Last! 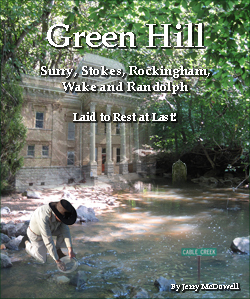 This book is a genealogical study of the family of Green Hill and Nancy Mitchell beginning with his birth in then Surry County to Reverend William Hill and his wife Elizabeth Halbert. The book begins with a study of the initial land records of Reverend William Hill in what is now Stokes and Rockingham Counties, NC. After Reverend William Hill's death, the Widow Elizabeth Hill remarried and the estate was divided. Green Hill and his brothers endured an extended set of court actions and petitions before the land was finally divided. Meanwhile, Green Hill moved to Raleigh, NC where his brother William Hill was living and settled in Raleigh around 1826. After the death of his wife Nancy Mitchell, Green Hill eventually moved to Randolph County, remarried, and remained in Randolph County until his death in 1862. This book is more than just the accounting of the family and includes extensive analysis of deeds, court records, private collections, newspaper accounts, and other sources to prove the descendants of Green Hill. This book was reviewed by the NC Genealogical Society as part of their awards program for "Excellence in Publishing." The judges comments included the following: "... well written in-depth study ... it obviously involved difficult analysis and exhaustive research ... liked the addition of land plat maps and other reproductions and transcriptions of records used in building your case ... Genealogists will undoubtedly benefit from the exhaustive research that you and your fellow researchers have put into this commendable study, which will be donated to the Genealogical Services collection of the State Library of North Carolina in Raleigh." A hardback copy of this book was reviewed in the North Carolina Genealogical Society JOURNAL, Volume 39, Number 2, May 2013 by Pamela S. Pearson, NCGS Book Review Editor. Dr. L. Jerry McDowell is a retired educator having distinguished himself as a mathematics teacher for 10 years and having enhanced the technology division of the Wake County Schools during the 1985-95 time frame. He served as the first Chief Technology Officer for the school system in the late 1990s and retired in 1998 to take on fulltime responsibilities as the director of contemporary music at his church. A George Foster Hankins Scholarship recipient at Wake Forest University led to his early career in education and his Masters of Arts Degree in Education and Doctorate in Education, both from Duke University, helped enhance his skill level and education profession. 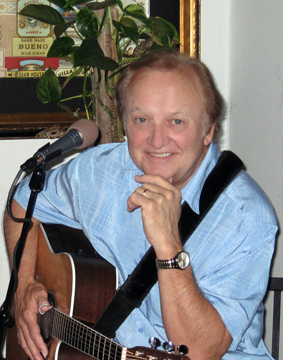 Dr. McDowell’s love of music inspired his work with contemporary Christian music and he currently is doing part-time work as co-director of music at a local church in Raleigh, NC, where he and his wife currently reside. His love for genealogy research began in 1975 working with his dad Harding Atlas McDowell and his brother Dr. H. Keith McDowell of Austin, TX. Jerry and Keith continue to pursue their research in their retirements. Our dad turned 92 in July 2012 and continues to be in good health and enjoys a good genealogy debate.